"This brush is larger than your average buffer brush. It is a full, dome-shaped brush for applying and distributing powder on the face for a polished, flawless finish. 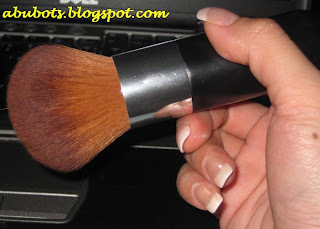 It is similar to a full size kabuki brush with a longer handle for better control." 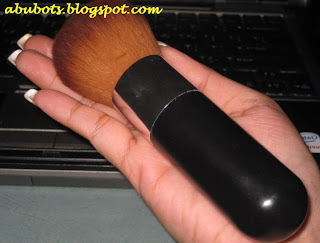 i fell inlove with this brush the first time i saw it at Shen's blog (she's an Ellana reseller). I immediately texted her, asking to reserve one for me. She told me that it will be available soon, and promised me that i'm assured of getting one. a month after, i got a package from Shen and as promised...i got the brush, as a GIFT! whoa, sweet! i've been using it ever since. 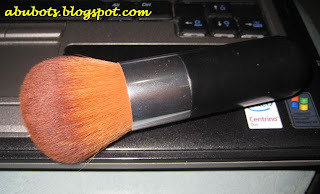 and now that i am back with MMU foundation for everyday use, this brush is my HG brush for the application. uber soft...it doesn't scratch at all! hmmm, like any other synthetic brushes...it takes time before it dries up. tip: put it in front of an electric fan to shorten drying time. aside from that, this brush is LOVE!